A visit to Szczecin is like swimming across various layers of history. The careful and curious visitor might be surprised to find a little Renaissance corner here, redecorated in the courageous style of the Enlightenment, with traces of the WWII, almost destroyed by the communists and rebuilt with the generous EU funding. Welcome in my favourite part of Europe, where the regular history books are never offering enough guidance for understanding. Therefore, the role of the travel and of the traveller is to find the proper human connections and an understanding beyond the many pages of the books. Maybe it sounds arrogant to say that I do not need too many translations to understand this part of the world. The reason is that I travel often in Central and Eastern Europe, but also have strong family connections and my PhD dealt with the history in the area. Plus, I also spent some bad amount of time in this part of the world, including during communism - luckily for a short but definitory time of my life. Poland is one of the countries in the area whose language I don't speak - but promise to learn it one day - but where I have good friends. This year, I was the second time here, after my January short trip to Wroclaw. My family loves to visit Poland and we are often encouraged to do so by the cheap prices of the Deutsche Bahn. For Szczecin, the cost of a 2-way trip for an adult is 20 Euro, a ridiculous price compared with the average cost to any normal destination in Germany. Thus, there were not worries or regrets when the trip was booked, in between many trips made and to be made for the next 4 weeks. 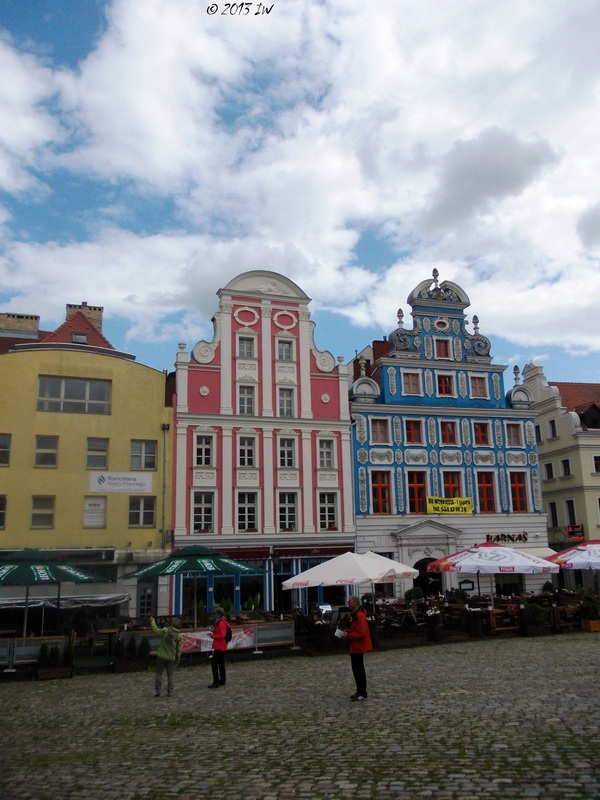 As in the case of Wroclaw, it was my second time in Szczecin, a small town near the German border, with a common German-Polish history - as many of the border towns in this part of the world. The first time I visited the city was shortly before moving to Berlin and I was fighting with a serious food intoxication. Plus it was a cold winter, not the right time for me to do a proper touring. This time, the weather was gorgeous and nothing bothered our journey, except history. I mean the problems created by a bomb from the WWII found in the Oder/Odra that blocked some certain streets for a couple of hours. In Berlin it is something happening every couple of months so the news did not surprise me. It took us more than 2 hours and a couple of questions to realize what was going on, as all we got when asked several time why we should not go through a certain park or street was either 'buum' or 'dangerous, no'. Curious and somehow desperate that we will miss some great historical benchmarks, we asked (again) in English at a Columbus coffee where we stop for some tasty rest and we were finally told the entire coherent history of the dozen of policemen and their cars on the street. History is everywhere, you see? The streets were full not only with tourists, mostly German, and worried policemen but also with people going to the park with the children, at shopping or walking hand in hand without a clear direction, regardless the age. Most were well dressed and kept up, not the usual street fashion one may see on the streets of Berlin at any moment of the week. At the train station, we found an Exchange office open and the 10 Euro we changed were enough for some little delights - especially the delicious fruit juices made locally. My luck ended when I arrived in the front of the tourist information center: it was closed. I was left without map or any special insight about what we can do in a relatively short amount of time. There are not too many bilingual signs or maps so the spontaneous visitor should better arrive with his/her own map in the pocket. Diverted by the apparently dangerous bomb, we walked slowly on streets that half reminded me of the lonely Paris streets of the suburbia, half of some deteriorated buildings in Budapest or Bucharest or Sofia. The colourful shops displaying fashion clothes were waking me up from time to time, but immediately I was lost in time again when looking at the old traditional shops of hats, alcohol or home decorations. The important moments - especially battles - and personalities from the more or less recent history of the town are represented by the statues situated in 'strategic' areas of the city: in parks, in the port or in the university area. The maritime history of the city is strongly represented, as the many images of anchors or monumental sailors let us know. The Baltic identity of Szczecin is pointed out not only from the geographical-trade perspective, but also as a reason to gather in the city 'Baltic' artists on the occasion of a common exhibition of young artists held at the beginning of the year or as part of the university tradition represented by Collegium Balticum. There it is also a Baltic Coffee, for the less intellectual among us. To the non-Polish speaker, the high concentration of theatres - an intellectual tradition in this country - may not say too much, but the beaux arts are equally speaking here, through the universal language of the visual arts displayed in the many galleries present all over the city. Most were closed on Sunday and we limited our exploration to some window looking. We saw some samples of modern courageous art there. Another surprise was waiting for me at the Pioneer Cinema, the oldest cinema in the world, still open to the public for short projections. We continued our quiet trip in and around the center and historical area, watching the buildings and the people. We passed by many restaurants and bars, open from the early morning till late in the evening, displaying besides the classical Chinese or Thai cuisine, also some local dishes, including with Ukrainian-Lithuanian influences. When too tired, we took the tram, trying to see what is on the other side of one of the bridges, in the port area, but we shortly realized that besides the colourful graffiti there it is nothing that may interest even the extravagant tourists as we are. Time to return to the traditional architecture and pastel colours. From my last trip I had clear memories of a huge yard of a castle hosting various cultural events. 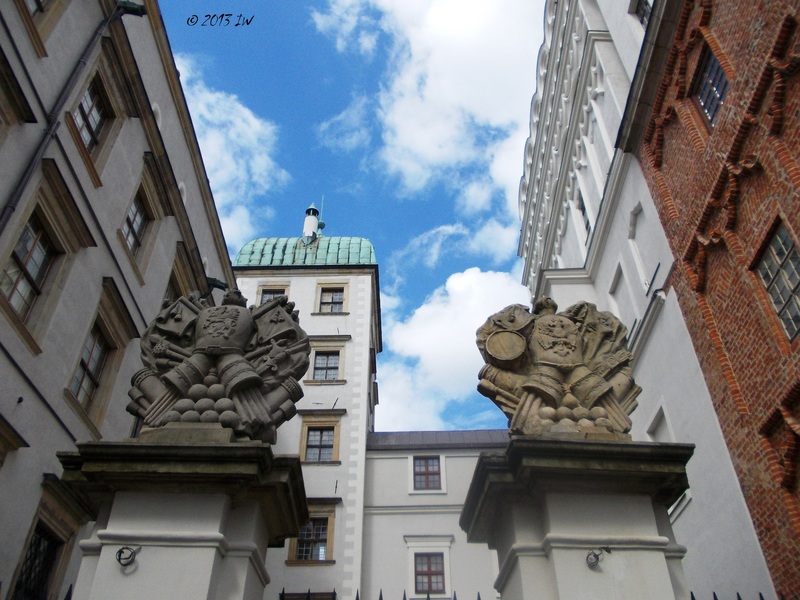 Only now I've found out the name and the history of the place: The Pomeranian Duks Castle. Situated close to the train station, It was built originally in the 13th century and reshaped in the 16-17th according to the rules of the Renaissance architecture. Nowadays, it hosts several official and cultural establishments. Don't miss having a look at the ingenious mechanical clock! At the end of the long walking and tram tour, I was the only one not extremely tired and ready maybe for more hours of discovery. But our train was approaching and no one was in the mood to spend the night here. Maybe, as the American tourists we met on the way back told us, this city deserves more than 24 hours if you look to have a better understanding of the people and the place. I bet I am not the only one keen to return for another Polish afternoon in the next 12 months.